When I first read the news that Aaron Swartz, the Internet activist, had committed suicide, I was, of course, saddened that such a young talent took such a terrible route. He had depression, which he had acknowledged publicly. But the more I’ve read about what happened, the more it has become clear to me, with undeniable certainty, that. as his family and friends (and now his attorney) claim, his problems were fatally compounded by the legal woes he faced in a battle with the federal government, the mightiest of all possible foes in the world. What crime did U.S. Attorneys Carmen Ortiz and Steve Heymann accuse him of committing? Allegedly using the computer network at M.I.T. to download nearly five million articles from a fee-paying database of academic articles called JSTOR, owned by a non-profit group. In an ironic twist, JSTOR long ago resolved all civil claims against him, publicly regretted its involvement in the case and last Wednesday, decided to make its archives available for free. 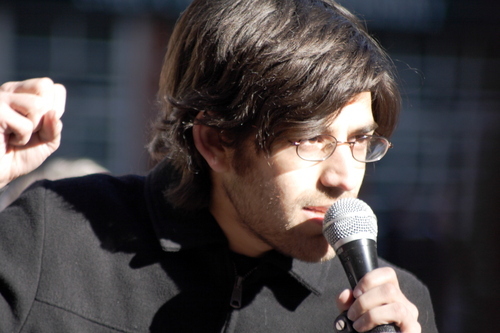 Swartz, who developed the RSS 1.0 specification when he was 14, helped co-found Reddit and campaigned for free access to information, was nonetheless charged with 13 felony counts and faced 35 years in prison and $1 million in fines if a jury found him guilty of the charges. He was 26 years old. To say that U.S.v.Swartz wasn’t a fair fight is a ludicrous understatement. Aaron didn’t stand a chance. Few people can intimately understand, though, just how devastating Aaron’s situation was, but I think that I can. Yes, his supporters and admirers spoke out, are speaking out now, regarding the unfairness of the situation, how harshly he was treated by prosecutors and how noble his free information cause was and is. But when the litigation gun is cocked and aimed at a helpless person, that person stands alone with no support. No matter how many people love you, agree with you, support you, the only thing that can provide any relief is for the gun to be lowered. And by all press accounts, the U.S. Attorneys were unwavering in their aim, unwilling to lower their weapon by even an inch. Ortiz said in a statement prior to Aaron’s death that “stealing is stealing, whether you use a computer command or a crowbar." In other words, the law is the law is the law. No shades of grey, no weighing of philosophical and technological shifts, no new issues to ponder, no compassion for the haphazard idealism of a young talented man. Case closed. This sense of isolation and hopelessness, when an all-powerful legal foe takes steadfast aim at you, is exquisitely more painful when the litigation itself is fundamentally crazy, and by that I mean, no one really gains anything from it (which is so often the case in any legal system) and it isn’t even clear anyone was harmed or how they were harmed. It’s even more excruciating if the punishment – in Aaron’s case, impoverishment, felon status and prison time -- is grossly out-of-proportion to the crime, if indeed a crime occurred. I know a little bit, and just a little bit, about what was going through Aaron’s head and heart. I once was at the end of that same gun, although the stakes for me were not as high and the case was a civil not criminal one. And I was much more mature and in much better shape emotionally than Aaron was. I felt strong and capable. Yet the enormity of dealing with litigation nearly sunk even me. What I was not prepared for was two brutal years of unexpected, nonsensical litigation in the federal courts brought by an adversary that had hundreds of millions more in annual revenue than I did. I could write endlessly about what happened and when and how ridiculous it all was, although that would be boring and probably unwise. But I spent a small fortune defending myself against a civil complaint (my adversary made a federal case of the matter -- and I now know the frightening meaning of that phrase, to make a federal case out of something) which was a buzzsaw of multiple and mind-boggling, unfounded allegations, some of which didn’t even seem possible to be violations of the law. From my vantage point, my adversary threw the spaghetti on the wall in either the hopes that one of the allegations would stick or in the hopes I would be so scared by the fearsome legal document, I would agree to anything they wanted. Which I would have done in a heartbeat, believe me, if their bottom-line wasn’t so consistently awful. And by all reckonings, the case against me was unfathomable and unfair and unwinnable. The point is not what happened to me or who was right or who was wrong in my case. Every conflict has two sides and even in Aaron’s case, I could argue a rationale for upholding what is technically the law (stealing IS in fact stealing after all and moral relativism can be dangerous in legal thinking). The point is how unspeakable it feels to be outgunned by a stalwart adversary with unlimited power with no clear upside for anybody. Not only must he have carried around a wordless sense of outrage and anger, but the legal system moves tortuously slow and can pulverize perspective. The oft-quoted phrase “the wheels of justice turn slowly, but grind exceedingly fine” is an apt metaphor for what happens in the thick of litigation. You start with the big picture but soon enough your day-to-day life becomes consumed with horrifying minutiae that only lawyers love and that you would rather not spend any time at all, much less most of your waking hours, contemplating. Procedures and debates over procedures soon occupy your thoughts. Theories about jurisdiction; arguments for and against procedural delays; whether certain counts should be dismissed or dismissed with prejudice or ruled upon by summary judgment; whether precedents exist for this argument or that argument. These kinds of intellectual exercises are crucial to a successful defense, to adequate legal representation and to managing your life in the best possible way you can but they kill your soul and make you feel lost in the woods of legal insanity where things get side-tracked into thickets of such arcane intricacy that you’re no longer sure about much of anything. Then there’s the paranoia, which, as the saying goes, is not paranoia at all if there is actually someone out to get you. Someone, the world’s most powerful force, was indeed out to get Aaron. In my case, my adversary hired a law firm whose mascot (yes, the firm proudly has a mascot) is a bulldog. As the litigation progressed, their attorneys ramped up the pressure, raised the rhetoric and generally did everything they could to scare me. It is a litigator’s job to win; instilling fear in the opponent only helps. As a consequence, my imagination sometimes ran wild. Had they hired private detectives to follow me? Was my phone tapped? Was my child being watched? Rationally I knew these things were probably not true, but the mere fact that these and other bizarre thoughts floated in my mind made me feel crazy. I’m afraid to imagine what ran through Aaron’s mind in the wee hours of the morning when the party trying to instill fear in him was the U.S. Government. Along with instilling fear, it is a litigator’s job to shame the opponent. On its face, the case against Aaron alleged that he was a criminal, which couldn’t help but seep into his psyche somehow. Beyond that, though, the U.S. prosecutors undoubtedly tried to make him feel like dirt by dredging up anything they could. It’s not unreasonable to expect that they stretched controversial aspects of his life into damnable character flaws or skewed ordinary human weaknesses into punishable offenses or even (and it does happen) made things up out of thin air. I don’t know, not really having the guts to read the full set of legal filings in his case and not being privy to the private conversations he had with his lawyers or that his lawyers had with the prosecutors. I know that in my case, as time dragged on, the harshness and allegations grew stronger and stronger and my sense of shame over things I did not even do grew stronger too. Then there is the financial aspect. Press reports indicate that Aaron, who seemingly made his own way in the world from an astonishingly early age, was mortified at the prospect that he might have to borrow money from others to finance his upcoming trial. That’s pure, unadulterated shame. It is not an uncommon tactic to try to bankrupt your foe in an effort to get them to settle. Along with the shame comes the sense of waste. Aaron was a young man, full of talent and promise and committed to social justice. But in the end he was wasting his time on something that was destroying his perspective, making him paranoid, filling him with shame, searing him financially and doing nothing for society in the process. Even at his tender age, he must have felt a higher sense of moral indignation about what was happening to him and impotent rage at how society’s resources were being wasted. When the dust settled, I often thought about the amount of time and money both sides spent in my litigation and I genuinely mourned for the waste to humanity. An ungodly amount of money went into my case, which could have gone toward so many other productive activities, business or otherwise. Many, many families in developing nations could have lived for years on the amounts spent on my lawsuit. Whole new lines of businesses could have been developed that might have ended up providing much needed jobs. I often thought about that. And I often thought: why didn’t we just take the dollars spent in my case, pile them all in the street and light the pile with fire? That would have been a far more efficient and better outcome for the world at large and I say that with complete seriousness. Needless to say, once a deep-pocketed foe aimed its sites on me, some people I considered friends and allies became scarce or looked at me with a gimlet eye. And friends and family members couldn’t always bear up under my woes, mostly out of a sense of helplessness that they could do nothing about the bulldog that had its teeth in my leg. I forgive everybody for everything and did so long ago. But while I was going through this episode of my life, I learned a painful lesson or two about betrayal. Aaron reportedly felt an even more painful sense of betrayal about those who did not stand up for him, particularly M.I.T., which violated its own open ethos in failing to help Aaron. I don’t know the specific facts of why M.I.T. did what it did, but the university has agreed to conduct its own soul search and report the findings and that’s good. Still, I understand why his parents condemn the supposed center of higher knowledge. I was far luckier than Aaron all the way around, with as good an outcome for me as I could have expected given the flawed nature of the U.S. legal system. But when I read the accounts of his life, his battle with the federal prosecutors, I think: what if I hadn’t been as lucky as I was? What if I had been younger or more fragile or less stubborn or less resilient? What if the stakes were as high for me as they were for Aaron? It’s too much to hope that those who use the justice system, be they private litigants or government prosecutors, pause to become more mindful of the consequences. My attorneys warned me that it is well understood among litigators that the justice system is a honey pot for broken people with misdirected anger, who pursue litigation to bolster their shaky egos or cover their own inadequacies or score points that they can’t otherwise seem to earn. For these people, the justice system will always serve as a means for filling their empty interior holes. But for others, I hope that if there is anything to be learned from Aaron Swartz’s untimely end, it is this: there are real human beings on the other side of the legal briefs. Sometimes they’re brilliant, young idealists who meant no harm, caused no harm, have a lot to offer and can’t bear up under the strain. Aaron was one of them.